After the crazy adventure of getting to Tobago, day two on the island had begun to erase that horrible experience. I was catching up with family and friends that I hadn’t seen in a long time and we were having a ball. One of the group activities we did was a day cruise along the Caribbean Sea. The sounds of Soca music rang while the crew members kept the rum punch flowing in epic proportions. We snorkled a bit then arrived to a small island where we were able to dance and sample some of the island’s most delicious and authentic foods. Mistake #1 – The meats were being prepared on a grill together, chicken and saltfish. Now, I’m allergic to some fishes, but I didn’t think I’d have any issues since the saltfish wasn’t a type of shellfish. I had a few pieces of chicken and it was yummy. We all continued to dance to Soca, crack jokes, and catch up with one another. After a while, I started to feel a little funny and my skin was starting to itch. I had just figured I was growing tired from being in the hot sun most of the day and being in and out of the salty sea water. We made our way back and upon arriving back to my room, I discovered I had broken out in rashes all over my body. I could only think of one reason why; eating that chicken that was cooked next to that saltfish. Ugh! The next morning: Wedding Day. 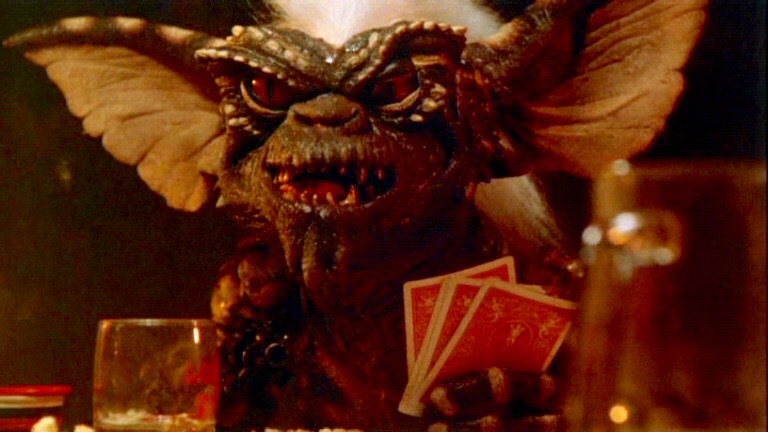 I woke up looking like Stripe from the movie Gremlins! When I tell you I scared myself when I first looked in the mirror, I mean my reflection was THAT BAD! I was freaking out (like I was actually the bride and my wedding was ruined), and considered not even going to my cousin’s wedding. But then came a miracle from God himself. My cousin-to-be’s aunt gave me this old ancient Caribbean remedy (I can’t even begin to tell you what it was). I was hesitant at first but it wasn’t like it could get any worse than it already was, so I took those pills. Within a matter of hours, my face and parts of the other rashes on my body had began to clear up. Hallelujah! I went to the wedding, and it was stunning! Carnival Time. We lucked up and were able to join another band for the Carnival Road March for the parade. Of all the hot summer days, this particular day was the hottest! It was so hot, I could barely get my costume on. I mean it was sticky hot, like pressure cooker hot! And of course the parade didn’t start on time. Our excitement had slowly melted away with our dripping sweat as we stood around waiting in the most uncomfy shoes. I curse those shoes! So there I was, standing again, for what seemed like days. We stood around, twirling our thumbs, taking selfies, talked smack, and whatever else we could think of to pass the time. Eventually we got tired of standing, so we scoped out some curbs and benches and popped a squat on them. Some even fell asleep. Below is what boredom looked like as we were waiting for the parade to start. Parade Party. The parade started….FINALLY. We sang and danced our way through the streets of Tobago. It was like a mix of Mardi Gras, the circus, and a big concert all in one. It was worth the wait afterall. So, after all of the hiccups and bloopers that happened during this trip, it ended on a high note. As I think back and look at all of the photos and videos, I laugh at the memories. I’m grateful to have experienced the culture of Trinidad and Tobago and meet some amazing people. Wouldn’t change any of it for the world…..well, except for that horrible rash! To see photos from Carnival Week in Trinidad and Tobago, visit my Where I’ve Been page. If you missed Part One, here is an excerpt. Note to self…never get married during Carnival Week. Here’s my horror story………..
To read the post in full, see Part One.